I am dedicated to capturing an outstanding photographic record of your wedding day whilst providing a quality service. I am an experienced wedding photographer who has lived near Reading for 40 years. As every wedding is different I offer a bespoke service for a set fee (I don't believe in add-ons such as paying for extra hours, or charging you for the rights to your photos). I make myself available on the day for whatever time you require. I offer unlimited consultation so that you get the pictures you want, and help to ensure your big day runs as smoothly as possible wherever I am involved. I take great pride in what I do. My clients find me affable, reliable and organised. I am always professional and am delighted to say that I can now count many of my couples as friends. Brides and Grooms love the photos I provide, and fully appreciate my involvement on the day. I don't take over, but will add to your special occasion! I feel incredibly lucky to do what I love for a living! If I sound like the type of person you want photographing your wedding then I'd love to hear from you! 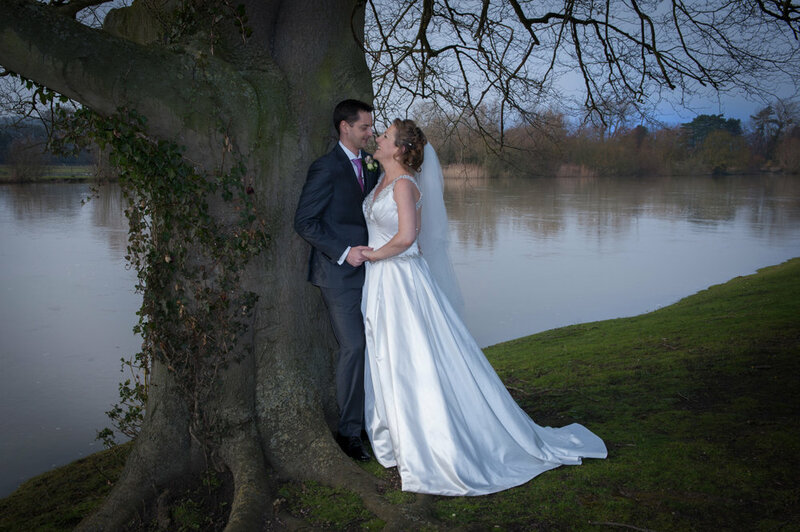 Despite being a Maidenhead wedding photographer I also work throughout the south of England, and some of my regular locations include Basingstoke, Bath, Bournemouth, London, Newbury, Reading, Salisbury and Southampton. Located on the banks of the River Thames, Maidenhead has a number of very good wedding venues. Its proximity to London and major road, rail and air networks make it popular for weddings where guests are coming from all directions and distances. Hotels, golf clubs and charming churches make super backdrops for your special day. My friendly, relaxed, yet organised approach, and ability to deliver the photos that Brides and Grooms want make me a highly regarded, popular choice. I work with you to create a wonderful, real account of your special day, showing all the love, emotion and fun. Throughout the day I mainly photograph in a documentary style. Think of me as an observer recording events with little interruption or intrusion. I like to capture natural and honest moments, without influencing or arranging what happens. Most of the time you'll barely know I'm there! Of course, you will want some Formal Group Shots too. Here I need to have a bit of control, and make sure the desired pictures are taken efficiently and in sensible time. For some beautiful Wedding Couple Portraits I add a little creativity. This needn't take long, and is an opportunity not to be missed! NO AWKWARD POSING, JUST YOU BEING YOURSELVES! During the Wedding Couple Portraits I will put you at ease. I want you to be you, so the whole process is very laid back. I will ask you to do things (all really easy and designed to pose you without you thinking about “posing”). Occasionally I will provide some simple, friendly guidance. Above all I look to create interaction, movement and fun in order to capture something special that is distinctly you! I really do care about the couples who hire me and fully appreciate the importance of their wedding day. It is my firm belief that you can and should build your wedding the way you want it. People can find this difficult (well let's face it most haven't been married before, so how can they be expected to know what's required). Weddings are what I do all the time, so I'm more than happy to help. Simple, open pricing from £895. Prices guaranteed for 2 years. No sales agenda. No sales pressure. WANT TO KNOW IF I'M AVAILABLE TO PHOTOGRAPH YOUR WEDDING? I am a member of the Society of Wedding & Portrait Photographers (SWPP), and therefore operate to the highest professional and ethical standards. GOOD LUCK WITH ALL YOUR WEDDING PLANS. I HOPE YOU HAVE A FABULOUS DAY!